Ch'ok'e Mountains British and French Somaliland-Ethiopia. 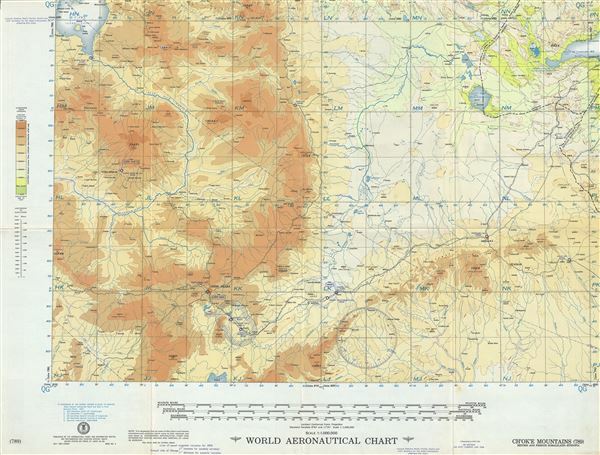 This is a scarce 1956 U.S. Air Force aeronautical chart or map of the north-western part of Ethiopia. It covers part of the Gojjam Province in the Amhara region of Ethiopia from Lake Tana south to Ziway Lake and east as far as Djibouti and the Gulf of Djibouti. The capital city of Addis Ababa is noted. The chart notes cities, towns, boundaries, roads, lakes, rivers, topography and other data essential for the air pilot. Verso features legends and a world aeronautical chart index. This chart was published by the Aeronautical Chart and Information Center and issued as chart no. 789. First issued in 1953, this is the fourth edition revised to Jan. 1956. Very good. Minor wear and toning along original fold lines.